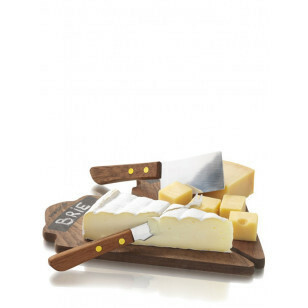 This elegant Cheese Dessert Set Taste from the Pro Collection makes a great presentation on the tabletop. With 2 mahogany cheese boards, a cheese knife and a cheese hatchet, consider serving cheese with drinks, as dessert, or an inbetween dinner course. Another nice feature is an area of the board where the names of the cheeses can be identified by writing with the enclosed chalk sticks. The cheese knives are made of solid stainless steel and have handles of mahogany. This complete set will surely bring something different to the table.